This article shows you how to build a Markdown editor through Blazor, an experimental .NET web framework using C#/Razor and HTML that runs in the browser with WebAssembly. BlazeDown is a proof-of-concept for an online Markdown editor built on Blazor. It's just an experiment; I wanted to kick the tires of Blazor. It is in no way intended to be a product or an example of best practices. I wanted to demonstrate that it's possible and that's all. A live demo of BlazeDown is available here: http://edcharbeneau.com/BlazeDown/. The repo for this demo is available on GitHub: BlazeDown. BlazeDown was built using Blazor, a client-side experimental framework for building native web applications using .NET and C#. That's right, this app was created with .NET and is running natively in the browser using WebAssembly. Thanks to Blazor, the app requires no plugins. This is because the code is compiled to WebAssembly, which is something your browser understands. Nearly everything you see here was written in .NET using C# with a few exceptions. Since Blazor is in the experimental phase (I can't stress that enough), some small workarounds are required for certain features. This experiment was to test out Blazor and see how easy (or difficult) it was to use a .NET Standard library on the client. The beauty of BlazeDown is that writing a Markdown parser was completely unnecessary because one already existed for .NET. BlazeDown takes advantage of the .NET ecosystem. It uses the MarkDig as an extensible Markdown processor for .NET. Since MarkDig is compatible with .NET Standard 1.1+, it worked flawlessly with Blazor. Having the freedom to reuse existing .NET libraries on the client is in my opinion what makes Blazor an interesting option for developers. Utilizing MarkDig in Blazor followed the standard procedure of grabbing the package from NuGet. Once the package was installed, MarkDig is initialized just as it would be in any other .NET application. The code for using Http.GetAsync is quite similar to how it would be used in a typical .NET application. An HttpResponseMessage is created to make the call to the resource using GetAsync. Once the response returns, we check to see if the response was successful using httpResponse.IsSuccessStatusCode. Finally, the resulting markdown file is returned, or an error message is passed along await httpResponse.Content.ReadAsStringAsync() : httpResponse.ReasonPhrase. 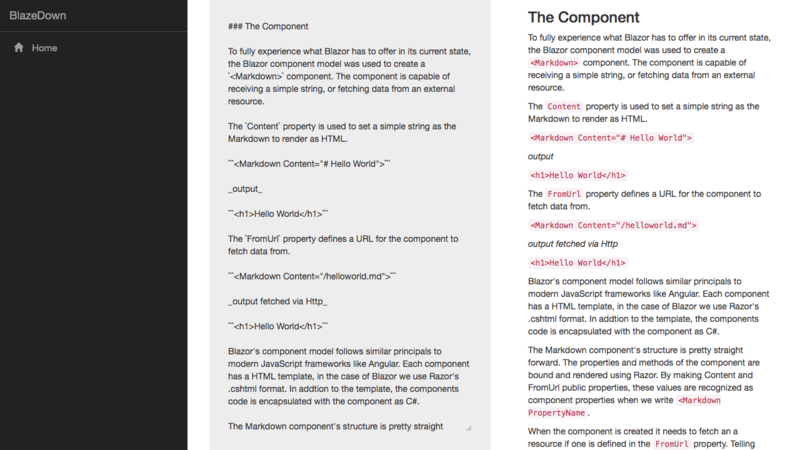 To fully experience what Blazor has to offer in its current state, the Blazor component model was used to create a <Markdown> component. The component is capable of receiving a simple string, or fetching data from an external resource. The Markdown component's structure is pretty straight forward. The properties and methods of the component are bound and rendered using Razor. By making Content and FromUrl public properties, these values are recognized as component properties when we write <Markdown PropertyName />. The code above represents the ideal code for the component. The ideal code mentioned above required quite a few hacks, remember that this is a 0.2.0 release and Blazor is very early in development. Browsing the source code on GitHub will reveal that much more is going on behind the scenes. The first major issue is that Raw HTML cannot be rendered with Blazor. This means when MarkDig calls ToHtml the literal HTML is rendered on screen as string, ex: <h1>Even the H1 tags are visible</h1>. In order to make raw HTML render properly, two methods are used. Despite being both ugly and quite cool at the same time, it's necessary. Blazor still has a lot of work to eliminate the need for interop and quirky hacks like these. BlazeDown uses data binding to update the HTML preview when a user enters content in a <textarea> on the page. By binding <textarea> and <Markdown> components together, the online-markdown-editor experience is completed. Blazor is quite an amazing idea and worthy experiment. It's exciting to see how easy it was to create an experiment like BlazeDown. Using mostly C# and existing .NET libraries, a client-side Markdown editor was created with minimal effort. While Blazor clearly has flaws, as one would expect from an early-in-development experiment, if Blazor was a matured product and the hacks shown above were not necessary, the entire process of creating BlazeDown would have been simple and straightforward. Even with the inconveniences mentioned above, the BlazeDown experiment is quite a success. It's exciting to see Blazor being built. The community is experimenting right alongside the dev team, providing feedback, issues and pull requests on the Blazor GitHub repo. If you are interested in the latest developments in the .NET ecosystem, I also recommend our whitepaper, The State of .NET in 2018 for more on the new .NET Standard and its accompanying technologies.